Welcome to my first blog post! What other way to start off a food blog than with a celebratory recipe. My king cupcakes are inspired by the delicious Mardi Gras tradition of King Cake. Typically, this dough-styled cake is filled with cinnamon, decorative sugar, pecans, a plastic baby toy, and then baked off in the oven. Custom has it that the one who finds the baby in their slice of cake, wins gifts and the chance to host next year’s Mardi Gras party. And even though Mardi Gras was a few months ago doesn't mean you can't make this dish for any festive occasion. Taking a spin off this classic cake, I decided to make red velvet cupcakes with a hidden toy surprise, like the one found in king's cake. Red velvet is without a doubt one of my favorite, if not, absolute favorite, cake flavor. Its deep red color and light, moist cake make for an exceptional dessert. Red Velvet has its roots in Southern cuisine, but now-a-days, you can find the dessert almost anywhere in the US. The cake is usually made with buttermilk, cocoa, butter, flour, and red food coloring (beet juice or artificial coloring). For this recipe, I am using everything but the butter. And what goes better with red velvet than rich, velvety cream cheese frosting. I dye it slightly pink to compliment the red cake, then add decorative pink glitter and edible beads to create a festive look. For the toy surprise, I am using a little plastic dog I got a the 99cent store. If you can’t find it at your local store, you can always buy them online. These delectable red cupcakes are perfect for parties, gifts, snacks, celebrations, or just personal consumption. The added toy surprise makes it fun to enjoy with friends, and you can create any rules for the lucky finder. Have fun! In a large bowl, sift together flour, sugar, baking soda, salt, and cocoa powder, and set aside. 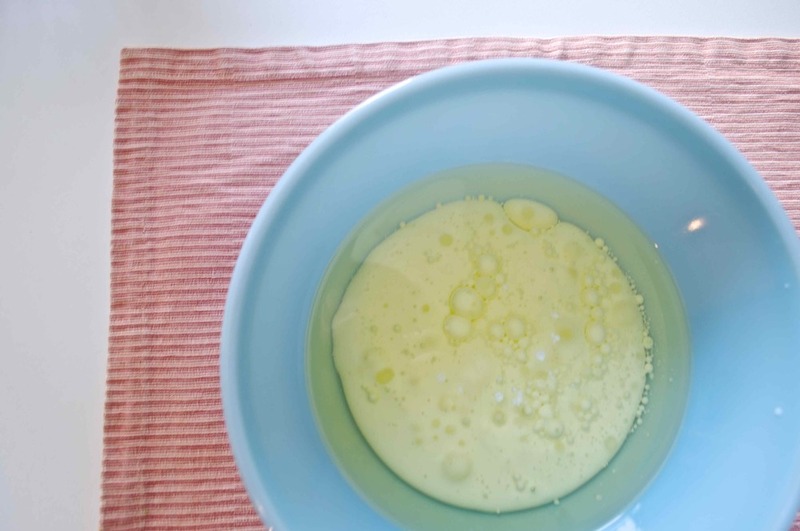 In another bowl, whisk the vegetable oil, buttermilk, eggs, food coloring, vinegar, and vanilla extract together. Gradually add the dry ingredients to the wet ones. Stir until just combined and a smooth batter is formed. Scoop the batter into the muffin cups, about 2/3 full. When adding the plastic toy to the muffin tin, pour 1/4 full of batter, add the toy to the center, making sure it doesn’t touch the edge, then top with batter so that the toy is completely submerged. ** Bake the cupcakes for 20-25 minutes, until a toothpick inserted in the center comes out clean. Transfer to a wire rack and let the cupcakes cool completely. Using an electric mixer or whisk by hand, mix together cream cheese and butter, until light and fluffy. Add the sugar, vanilla extract, and food coloring until mixture is smooth. Chill in the refrigerator for about 30 minutes before applying it to the cupcakes. For the frosting, you can choose any design and technique. Cold frosting makes frosting much easier and less crumby. Using a piping bag, or zip-lock bag (just cut off the tip), frost the cupcakes from the center in a spiral motion, swirling outward. If you choose to use a buttering knife, begin with a thin layer. Pop the cupcakes in the fridge for 15 minutes until the frosting sets and continue with a second layer. This way, the crumbs will be contained to the first layer. For decorating the cakes, I like to use edible glitter and beads and make each cake different. 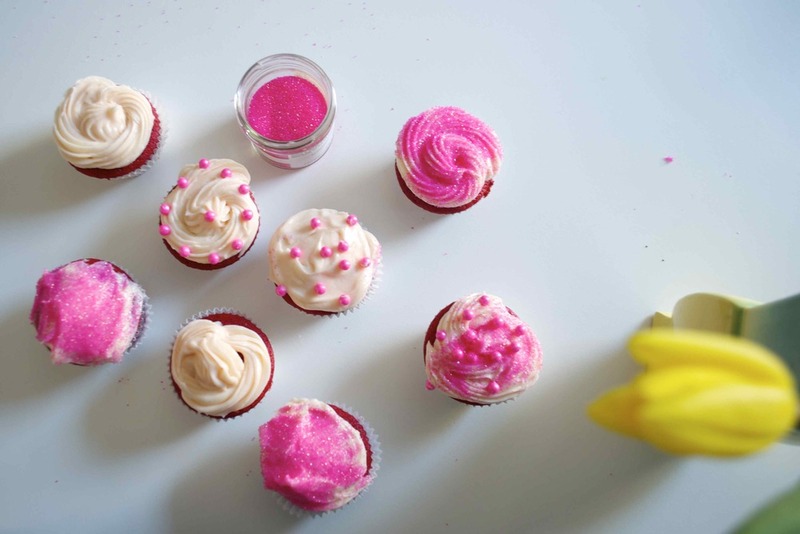 There is so much flexibility with how to frost, color, and decorate these cupcakes. So whatever you do decide to do, just make sure you have fun! **Note: The toy should be fine cooking in the oven, but if you are concerned about the plastic, you can add it after the cupcakes are cooked. Before frosting, with a spoon, scoop out a little chunk of the cupcake from the top, add the toy doll, and frost on top. No one will know!